Researchers from FOM institute AMOLF and the Max Planck Institute for Polymer Research (Mainz, Germany) have determined the conductive properties of ultrathin graphene layers under the influence of light. The results of their research could lead to the design of a new class of solar cells. Graphene is built up from a single layer of carbon atoms. The material can absorb light and conduct electricity. To make graphene suitable as a basic material for a solar cell, researchers must change its properties so that the graphene acquires an electronic 'band gap'. Without a band gap the electrons released by the light quickly decay. Electrons can assume wide range of different energy levels but a band gap forms a 'forbidden zone': not a single electron can enter this energy level. To create a band gap researchers make use of quantum confining effects. The researchers produced nanoribbons of graphene by using a new, chemical bottom-up method. These ribbons have a width of just one nanometre (one billionth of a metre) and are more than two hundred nanometres in length. The electron wants to occupy more space than is available in the one-nanometre width of the ribbon and is therefore ‘confined’ in this dimension. Due to this confinement a band gap arises. The researchers let an ultrarapid pulse of laser light fall on the graphene ribbons. The laser light releases charge carriers in the material, as a result of which electrical current is produced– just like happens in a solar cell under the influence of sunlight. To study the charge carriers, the researchers used a specially developed terahertz (THz) spectroscopy technique. THz spectroscopy can determine the photoconductivity at a sub-picosecond timescale without the need for electrical contacts. The researchers compared the results with the photoconductive properties of carbon nanotubes, the rolled up variant of graphene nanoribbons. Both materials are key components in the emerging discipline of carbon electronics. Knowledge of the conductive properties of both materials is therefore vitally important. Using the THz technique, the researchers determined the concentration and recombination rate of the charge carriers in the graphene. They demonstrated that the laser light (in contrast to previous reports) made electrons mobile in both materials, as result of which an electric current arises. The carbon nanotubes were found to be better conductors than the graphene nanoribbons. The researchers published their work in Nature Chemistry and Nano Letters. 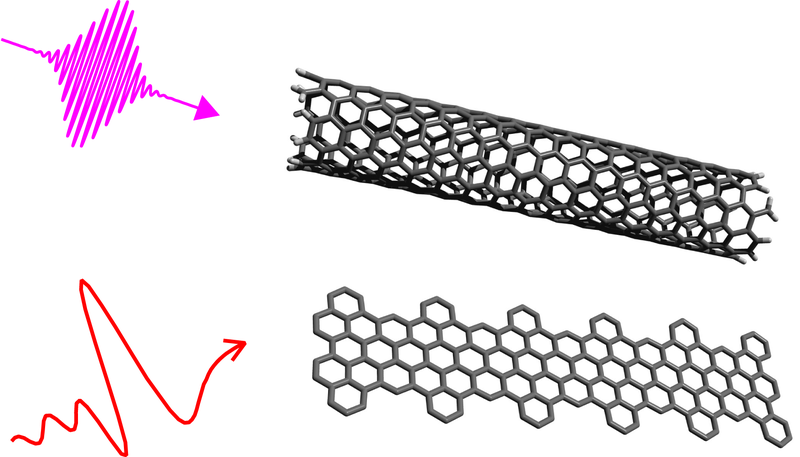 A carbon nanotube (top) and a graphene nanoribbon (bottom). An ultra-rapid laser pulse (purple) comes into contact with the structures as a result of which electrons are released. The researchers then examined how fast the electrons recombined by targeting a brief THz pulse at the material.